What is an Active Member and how do I know how many are in the campus? An Active Member is someone that is enrolled in your campus that logs in and accesses the campus. You may have members that are enrolled into your campus, but do not access the campus during the calendar month, these members are not considered "Active" and will not contribute to the Active Member count. The Active Member report allows you to drill down further into your active members. Active members are important as they determine your pricing band. Check out the Plans and Billings section in your settings to see how many active members your plan allows. To access the Active Member Report, click on the Reports button in the navigation pane. Within this report you'll see a complete list of all your active members and all your inactive members for the past month. 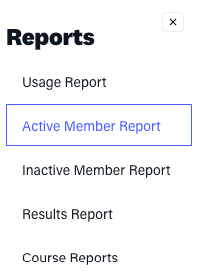 You can export your active members list for your own records by clicking the Export Active Members button at the top of the report.